Only a new paradigm of global cooperative governance can provide real solutions to our difficulties. Now we must re-order our priorities, and place the well being of the earth before that of individual people or states. This will require the cooperation of people all over the world. When people change, politics change. Whether or not we create an equitable global community is up to us. The following article is here by permission. OTTAWA, July 7, 03 (LifeSiteNews.com) - As if population control guru and one-worlder Maurice Strong did not have enough to do as a top advisor to the United Nations and the World Bank, and running confabs for the world's wealthiest and most powerful, he is now being courted as a top advisor to Paul Martin, the man set to become Canada's next Prime Minister. The Ottawa Citizen reports that Strong's new role will commence at the end of this year or early next, after the Nov. 15 Liberal leadership race. Hanne Strong, Maurice's wife, told the Citizen's parent company CanWest that she and her husband have bought a condo in downtown Ottawa and intend to move back to Ottawa as early as November. Mrs. Strong runs a synchretic New Age centre on the couple's 160,000-acre Baca ranch in Colorado. Despite being an environmental extremist and admitted overpopulation doomsayer who has publicly endorsed legal limits on family size, Strong is nonetheless well regarded by world leaders. 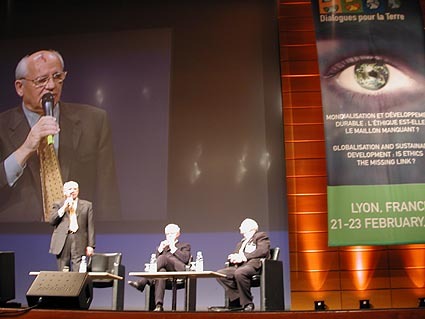 Touted as one of the most well connected men on the planet, Strong has used his extensive web of high level international connections to advance the demise of national sovereignty, democracy and traditional religion and other elements he believes are causing an over-populous and environmentally-irresponsible humanity to endanger the planet. Beginning with the concept of fostering a new "global ethic", Strong, along with fellow de-population advocates Mikhail Gorbachev and Stephen Rockefeller, co-produced the Earth Charter to be a New World Ten Commandments. Such nonsense would normally not be taken seriously except for the connections that Strong has at the U.N. and with many current and past world leaders. For years, conservative intellectuals have derided those who voiced concerns about Strong's Earth Charter and his plans for the demise of Christianity. However, earlier this year the Vatican warned against the "global ethics" which are the origin and core of the Earth Charter. In an article published in L'Osservatore Romano on February 11, Archbishop Javier Lozano Barragï¿½n, president of the Pontifical Council for Health Care Workers warned that the aim of the program was to supplant Christian values with a "global ethic." The Archbishop called the 'global ethic' movement an eco-religion which holds "sustainable development" as the highest good. He said it manifests itself "as a new spirituality that supplants all religions, because the latter have been unable to preserve the ecosystem." In a word, this is "a new secular religion, a religion without God, or if you prefer, a new God that is the earth itself with the name GAIA," he said. "The different religions existing in the world have been unable to generate this global ethic; therefore, they must be replaced by a new spirituality, which has as its end global well-being, within sustainable development," explained Archbishop Barragï¿½n. 9. Our Global Neighborhood, The Commission on Global Governance (Oxford University Press, 1995), 110-111. JOHANNESBURG, Sep 13, 02 (LSN.ca/CWNews.com) - Surprisingl y, without much media fanfare, the Earth Charter, hailed as the "Ten Commandments" of the New Age, was unveiled at the Earth Summit last week. However, the lack of media attention and public notice may be purposeful. William Jasper, who co vered the unveiling ceremony for New American Magazine, reports: "Apparently, the plan is to orchestrate a global stealth campaign for the Charter among a sympathetic core constituency. As the campaign picks up steam, activists will obtain signatures and public support for this new global ethic from local, state, and national governments, schools, and organizations-- without stirring the suspicions and opposition of churches, pro-life, and pro-family forces." The Charter's founding proponents, Mikhail Gorbachev and Maurice Strong, both have referred to the Charter as a new "Ten Commandments" to guide the new age "global spirituality." The religious overtone is intentional. Moreover, the Earth Charter backers, including Stephen Rockefeller, have fashioned an Ark of the Covenant look-alike "Ark of Hope" to house the "sacred" Charter. The Ar k was ceremoniously carried to United Nations headquarters in New York last year and was put on display in Johannesburg. With UN language, the Charter promotes abortion (using the terms "reproductive health and responsible reproduction") and homosexuality (banning discrimination based on "sexual orientation"). The New American reports that the Charter will soon be makin g its way to schools, city governments, state legislatures, teachers organization s, civic groups, professional associations, judges, and law schools. The magazine suggests, "Once a critical mass of support has been built among students, teachers, journalists, and public officials, the Charter will appear to be universally accepted and unstoppable." The dominant patterns of production and consumption are causing environmental devastation, the depletion of resources, and a massive extinction of species. Communities are being undermined. The benefits of development are not shared equitably and the gap between rich and poor is widening. Injustice, poverty, ignorance, and violent conflict are widespread and the cause of great suffering. An unprecedented rise in human population has overburdened ecological and social systems. The foundations of global security are threatened. These trends are perilousbut not inevitable. Transmit to future generations values, traditions, and institutions that support the long-term flourishing of Earth's human and ecological communities. Establish and safeguard viable nature and biosphere reserves, including wild lands and marine areas, to protect Earth's life support systems, maintain biodiversity, and preserve our natural heritage. Ark of Hope-- This is an amazing blasphemy. "Do not do unto the environment of others what you do not want done to your own environment....My hope is that this charter will be a kind of Ten Commandments, a 'Sermon on the Mount', that provides a guide for human behavior toward the environment in the next century." On September the 9th, 2001 a celebration of the Earth Charter was held at Shelburne Farms Vermont for the unveilling of the Earth Charter's final resting place. This "Ark of Hope" will be presented to the United Nations along with its contents in June of 2002. It is hoped that the United Nations will endorse the Earth Charter document on this occasion; the tenth anniversary of the UNCED Earth Summit in Rio. It was hoped that an Earth Charter would be the result of this event. This was not the case, however an international agreement was adopted ï¿½ Agenda 21 ï¿½ which layed down the international "sustainable development" necessary to form a future Earth Charter agreement. Maurice Strong hinted at the overtly pagan agenda proposed for a future Earth Charter, when in his opening address to the Rio Conference delegates he said, "It is the responsibility of each human being today to choose between the force of darkness and the force of light." [note: Alice Bailey, and Blavatsky before her, used these terms often. Their writings state that the 'force of darkness' are those who adhere to the 'out-dated' Judeo-Christian faith; those who continue along their 'separative' paths of the one true God. The 'force of light' (Lucifer), in there view, is the inclusive new age doctrine of a pagan pantheistic New World Religion. In the New Age of Aquarius there will be no room for the 'force of darkness' and 'separativeness'.] "We must therefore transform our attitudes and adopt a renewed respect for the SUPERIOR LAWS OF DIVINE NATURE," Strong finished with unanimous applause from the crowd. 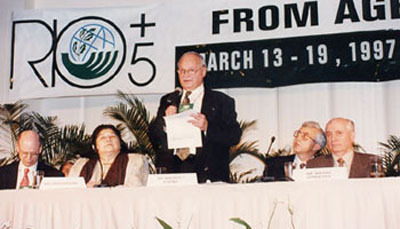 Despite the disapointing setback of no official agreement toward a "peoples Earth Charter", Maurice Strong forged ahead, with Rockefeller backing, to form his Earth Council organization for the express purpose of helping governments implement UNCED's sustainable development which Agenda 21 had outlined. Agenda 21 was perhaps the biggest step taken to facilitate any future "enforcement" of a patently pagan Earth Charter. According to Strong "the Charter will stand on it's own. It will be in effect, to use an Anglo-Saxon term, the Magna Carta of the people around the Earth. But, it will also, we hope, lead to action by the governments through the United Nations." "Cosmos is my God. Nature is my God." "A post-Christian belief system is taking over ï¿½ one that sees the earth as a living being mythologically, as Gaia, Earth Mother ï¿½ with mankind as her consciousness... Such worship of the universe is properly called cosmolatry." The "For Love of Earth" day-long celebrations at Shelburne Farms Vermont began with an early morning pilgramage during which 2000 or so participants, led by Satish Kumar, walked to the "great barn" where they were greeted by the sounds of the "Sun Song" played by musician Paul Winter. The Pagan festivities continued with the words of Dr. Jane Goodall, Satish Kumar and organizer Dr. Steven C. Rockefeller. The Earth worshippers were treated to dance, music and paintings of several Vermont artists, after which they joined hands and offered an "Earth prayer" of "reverence" and "commitment" to Mother Earth and the "Ark of Hope". Satish Kumar, who led the early morning pilgramage at Shelburne Farms, is an an influencial advocate of Gaia. 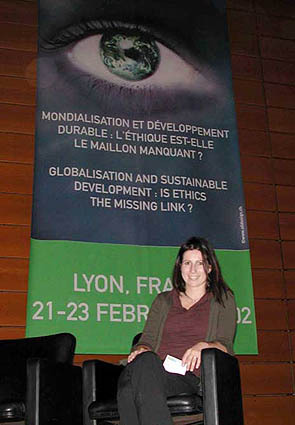 Kumar says that "contemporary thinkers of the green movement are collectively developing an ecological world-view." The Earth Charter is the green movement's crowning achievement toward this holistic world-view, and the practical means by which all of us will soon be held accountable to "Divine Nature". According to Satish Kumar, 2 this pagan view has five ingredients: Gaia (James Lovelock), Deep Ecology (Arne Naess), Permaculture (Bill Mollison), Bioregionalism (Gary Snyder et al. ), and Creation Spirituality (Matthew Fox). "Creation Spirituality" is what had, undoubtedly, taken place at the Shelburne Farms Earth Charter celebrations. In the words of Steven W. Mosher, president of Population Research Institute, "Gaia is the New Age term for Mother Earth. The New Age believers hold that the earth is a sentient super-being, kind of goddess, deserving of worship and, some say, human sacrifice. Compared to Gaia worship, the simple animism of primitive cultures is wholesome." Musician Paul Winter also has deep roots within the green movement and "creation spirituality." He has performed concerts at the Cathedral St. John the Divine in New York City, on the solstice and equinox, for well over twenty years. These pagan festivals, in a supposedly christian church nonetheless, are generously sponsored by the Rockefeller Foundation and a new age organization called the Lindisfarne Institute ï¿½ the latter of which has its headquarters in the Cathedral. Maurice Strong is also a member of Lindisfarne (publishers of G-A-I-A, a way of knowing) along with Gaia theory biologist James Lovelock, and admitted Luciferian David Spangler, among others. Paul Winters' most recent concert at St. John the Divine was for the annual Earth Mass, on 7 October. 3 The fact that this annual October 7th Earth Mass coincides with the hindu Holy Day of Dassehra (worship of the Great Divine Mother) cannot be a coincidence. Winter and bandmates play a tune called Missa Gaia as part of the Feast of St. Francis. The Pope once attended the Feast of St. Francis at St. John the Divine in 1986. Stressing the unity of all the world's religions, John Paul II happily shared the platform with a Tibetan Lama, a Hindu swami, a Native American medicine man, and a Moari high priest. The New American Insider Report of January 23, 1995 4 writes that the historic Episcopal Cathedral of Saint John the Divine "has long been a center of New Age and radical-left 'enlightenment' and high-brow Establishment 'culture'." Author Gary Kah reports, in his well-documented book The New World Religion, that the Cathedral of St. John the Divine displays "a female Christ on the cross, complete with shapely hips and full breasts." Also in the same issue of The New American there is a list of donors to the Cathedral: Mr. and Ms. Steven Rockefeller is among them, along with Mr. Robert de Rothschild; David Rockefeller Jr.; Mrs. Mary C. Rockefeller; Mr. and Mrs. Laurance Spellman Rockefeller; Rockefeller Center Properties Inc.; The Rockefeller Group Inc. and many elite-of-the-elite organizations such as J.P. Morgan & Co.; Chase Manhattan Bank; Goldman, Sachs & Co.; Hearst Corporation; CBS, Inc. and even, mysteriously, the Federal Emergency Managment Agency (FEMA), among others. The United Nations even has their own in-house prophet, Sri Chinmoy. This 70 year-old indian mystic is the official Spiritual Advisor to the United Nations. For the past 23 years he has offered prayer and meditation meetings for anyone to attend every Tuesday and Friday at the U.N.5 Sri Chinmoy claims to have been Thomas Jefferson in a previous life, and he also claims to be the Spritual Brother to Jesus Christ.6 Chinmoy's disciples claim he's one of a handful of fully enlightened beings on the planet. Some disciples go so far as to claim he is an avatar, a living God. They meditate to a print of his face. To Sri Chinmoy and Robert Muller, world peace will ultimately depend "on divine and cosmic government" and an "alliance between all major religions and the U.N." Muller has gone so far as to call the U.N. "the body of Christ." The United Nations "will be the last word in human perfection," Sri Chinmoy proclaims, it will "stand as the pinnacle of divine enlightenment." The Earth Charter stresses that man is his own saviour. By saving "mother earth" we will once again return to an idealic Garden of Eden. But instead of worshipping the Creator, the New Age Aquarian conspirators wish to plunge us headlong into a creation-worship new world religion. "Little by little a planetary prayer book is thus being composed by an increasingly united humanity seeking its oneness," Robert Muller preaches. "Once again, but this time on a universal scale, humankind is seeking no less than its reunion with 'divine,' its transcendence into higher forms of life. Hindus call our earth Brahma, or God, for they rightly see no difference between our earth and the divine. This ancient simple truth is slowly dawning again upon humanity, as we are about to enter our cosmic age and become what we were always meant to be: the planet of God." Professing themselves to be wise, they became fools. And changed the glory of the uncorruptible God into an image made like corruptible man, and to birds, and fourfooted beasts, and creeping things. Wherefore God also gave them up to uncleanness, through the lusts of their own hearts, to dishonour their own bodies between themselves: Who changed the truth of God into a lie, and worshipped and served the creature more than the Creator, who is blessed forever. Amen. Thousands of local, national, regional, and international organizations have now endorsed the Earth Charter. The most recent endorsement has come from the Parliament of the Worldï¿½s Religions. On Thursday January 24, 2002 the Ark of Hope will be carrying the Earth Charter and the Temenos Books to the United Nations  15 to 20 blocks, from the Interfaith Center of New York to the United Nations. Copyright © Terry Melanson, unless otherwise noted. Reproduction is granted, and encouraged, on condition of author citation and a hyperlink back to this page. The devil is preparing his filthy legions of dark angels and wicked human disciples for the coming, brutish times. The devil and his agents well know of the prophesied, scorched-earth droughts, seas of blood, and life-destroying water shortages to come. Indeed, Satan and his human helpers are the "change agents" who have planned and are now engineering most of these catastrophic water disasters! As I uncover and expose in my latest video, The Coming Great Thirst, the super-rich of the Illuminati have quietly been buying up shares of stock in water companies. They have also been acquiring huge expanses of raw land in Colorado and other states, under which flow billions of barrels of water through underground aquifers. They intend to haul in truckloads of cash on the back of the miserable masses who will be willing to pay anything--exorbitant sums--to stay alive by buying scarce water to drink. One such Illuminatus, billionaire Maurice Strong, former Chairman of the UN's Environmental Program, is now the chief shareholder and the managing director of Ontario Hydro, Canada's largest water corporation. Strong also has acquired thousands of acres of land in the thinly populated, but expansive, Baca Grande region of America's West. As a result, Strong and his rich pals now own aquifer water rights affecting almost the whole of Colorado as well as several other western states. When the crunch hits and people in those states are dying for lack of water, it is to Maurice Strong and his associates they must turn. They will be forced to grovel before the former United Nations bigwig on bended knees, begging for a few drops of the world's most precious, but rare, resource: pure, clear, water! Thanks to Constance Cumby for leading the way in the investigation of Maurice Strong and his demonic friends.